Can Europe’s banks save the EU? The multibillion-dollar fine recently imposed by the US Government on Germany’s Deutsche Bank for misselling mortgage securities in the US has done little to improve confidence in the European Union, which remains plagued by slow economic growth, high unemployment, immigration challenges and mounting uncertainty. What the Deutsche Bank scandal has done is shine a light on a last-resort option – a kind of ‘Hail Mary pass’, in American football terms – that could potentially save the European project. Despite representing around 20 percent of world GDP, the eurozone does not have a top 10 bank or financial services institution in the FT 500 global ranking. The knock-on effects of such a fragmented and vulnerable banking system are apparent in Europe’s relatively poor showing in other sectors, such as technology and energy, that are vital for EU members’ economic future. Europe has no shortage of banks: Germany has more than 1,500, and Italy has over 600. But many of these are so-called ‘zombie banks’, with too many branches, too few deposits, and funding costs that far exceed those of their more successful peers. In fact, according to the International Monetary Fund (IMF), some one-third of Europe’s banking sector – representing assets worth $8.5trn – remains weak and unable to generate sustainable profits. All of this creates significant downside risks for the EU economy and, ultimately, the entire European political experiment. Restoring stability in Europe’s banking system, by the IMF’s own estimate, will require at least one-third of Europe’s banks to close or merge. For Deutsche Bank, market speculators already seem to be expecting a merger, such as with Commerzbank, another German institution. But, if such a merger is to be the first step toward consolidating the European banking sector and strengthening the EU, it should be a cross-border affair, bringing Deutsche Bank together with a significant French and/or Italian financial institution. Such an approach could be a game changer in terms of the EU’s political credibility, which is perhaps most crucial to keeping the EU dream alive. A cross-border European bank merger would have several benefits. As with any merger, consolidating weak, underperforming banks would enable them to strengthen their balance sheets and restructure non-performing loans – estimated to be worth some €1trn ($1.1trn), roughly three times higher than other global jurisdictions – thereby benefiting the wider economy. But a cross-border merger that creates a kind of European super-bank would be even more effective in addressing perennial operational challenges (in particular, liquidity and capital). More important, this type of financial restructuring would open credit channels that are vital to fund investment and drive economic growth. A cross-border European merger would also give a key region of the world economy a bank that is commensurate with its global importance. A European banking champion would be far more competitive globally, rivalling the brawn of the US’ dominant banks. Creating such an institution is particularly urgent today, given that many countries worldwide seem to be increasingly rejecting economic openness in favour of more protectionist policies and balkanised regulation. In a more fragmented, less globalised world, where cross-border capital flows are declining – last year, the Institute of International Finance has reported, net capital flows for emerging markets were negative for the first time since 1988 – Europe’s banking infrastructure will need to become broader and deeper in order to thrive. 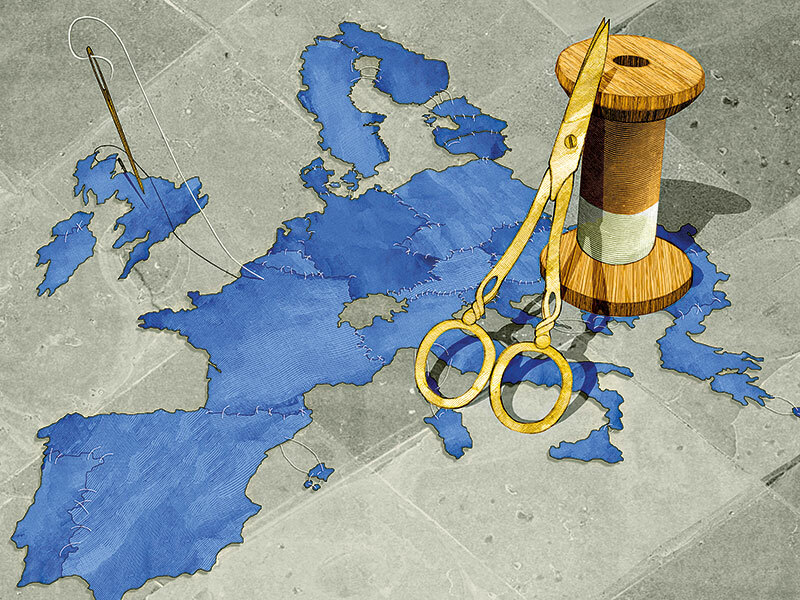 The third – and perhaps most important – reason why cross-border mergers might be the key to saving Europe’s banking sector is that they would signal to market participants and European citizens alike that political leaders are committed to European integration. Again, the political and economic backdrop intensifies the urgency of such a move. Progress toward fiscal integration has stalled. National agendas have often taken priority over cooperation. And the UK is set to start negotiating its way out of the EU altogether – a decision that can reasonably be viewed as an indictment of Europe’s current integration model. From the perspective of financial markets and investors, a cross-border merger would be viewed bullishly, boosting confidence. Even for ordinary citizens, any indication that the EU is not simply going to fall apart would carry major benefits, offering some semblance of assurance in a highly uncertain environment. To be sure, a cross-border merger is a radical proposal. The amount of political will it would require will not be easy to muster. But no bold play is ever a sure thing. The truth is that, without credible and transparent evidence of deepening linkages – not just in fiscal matters, but also in business and finance (the backbone of a modern economy) – the EU will remain a loosely connected and not particularly credible collection of countries. As we have seen in the last few years, such an arrangement will not resolve those countries’ economic woes. One might argue that now is not the time to push toward greater integration. The situation is too fragile, and popular opposition is too strong. If growth were even middling, sceptics might say, the political environment would be far more amenable. But the EU’s current disjointed structure will not hold. If strong action is not taken soon, the cracks will only widen, generating increasingly powerful political discord and, ultimately, dooming the entire European project.